Our vanities and other products can be shipped across Canada. We can also ship to the United States but please email us at info@modernbathrooms.ca for a quote. Please include the item number, your city and postal code. The items are well packaged to ensure safe arrival and we use shipper's who have a proven track record. If damage does occur it is insured by the shipping company. Below is some information about the shipping options shown on our online store. 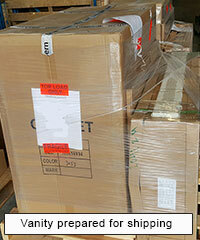 Shipping Cost "To Be Calculated"
Large shipments often require a custom quote based on your order and location. In that case in the online store Shipping Method will show as ' To Be Calculated' at check out. Please proceed with submitting your order so that we can get the quote. Your credit card will not be charged until you approve the shipping cost and the order can be cancelled if it is more than expected. Generally, we provide a quote to the shipper's depot in your area as well as a curbside delivery to your residence. With curbside delivery the items are not brought into your house. When placing your order, you may see the cost to a Shipper's depot close to you. If you can pick up the order at the shipper's depot it is the least expensive option. By selecting this option your total cost will be the amount specified online. If you would like to receive a residential quote or would like to see if there is a depot close to you, select the option "Residential - Send Quote" or "Shipper's Depot - Quote Closest". Note that most depots require pick up within 48 hours of arrival or they will charge storage fees, which are chargeable to the customer. See the depot list below to see depot addresses. While many online companies offer free shipping we have deliberately stayed away from that sales strategy. The reason is that there is no such thing as free shipping. Instead the shipping cost is built into the cost of the product. Local customers and those in major centers end up subsidizing the cost of products shipped to customers in remote locations. When you compare our products to others sold online please take the time to compare the end price after shipping costs and prices of accessories like faucets and mirrors are included. We believe that most of the time you will find that our products are a better deal. The shipping cost includes insurance however damage needs to be reported as soon as possible. When you receive your order please inspect it thoroughly. Any damage to the packaging must be noted on the weigh bill at the time of delivery or pick up. We recommend refusing the shipment if there is significant damage. Any hidden damage must be reported within 24 hours or the shipper may deny responsibility. Missing items or defects must be reported within 7 days. Damage or defect claims are not accepted for installed items. Items can be picked up directly from our Coquitlam, BC location. Please see Hours & Location page for our open hours. Curbside delivery within Metro Vancouver is available for $60 plus GST. In some instances, the online store will charge $120 for multiple vanities. This is an error and will be corrected when the order is received. With curbside delivery the items are brought into a carport or garage but cannot be delivered into a house. Cities served by our delivery option include Vancouver, West Vancouver, North Vancouver, Burnaby, Coquitlam, New Westminster, Richmond, Delta, Surrey, Langley, Pitt Meadows and Maple Ridge. For questions or quotes please email us and include the vanity model number, destination city and postal code. The chart below shows sample shipping costs to different depots based on recent shipments. Prices below include all taxes, fuel surcharges and insurance. Actual shipping costs may vary and are subject to change without notice. * Estimated transit time is from the time the shipment cost is approved by the buyer and applies to in-stock items only. Time estimates exclude weekends and holidays.